Happy Martishor! Lots of Peace to You! According to one legend, on the first day of March there came out to the edge of the forest a young lady, Beauty Spring. 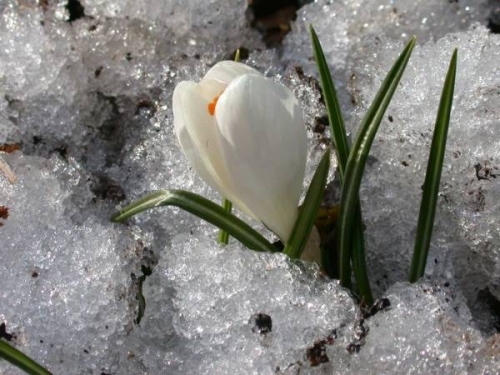 She looked around and saw a snowdrop making its way from under the snow through a thawed patch. The angry thickets of a blackthorn tightly surrounded it and did not let it grow. She decided to help the flower and started clearing a way around the ground, releasing it from prickly branches. Winter noticed what Spring was doing and grew furious. He spread his arms and called Cold Wind with Snow to destroy the snowdrop. Since then, people in Moldova, Romania and other Balkan counties weave two strings with white and red colors. Red symbolizes love and white – the beauty of the snowdrop, health and purity of the first spring flower. They send these talismans to their friends and give them as gifts on March 1. Every year on March 1 you put a Martishor on the collar of your jacket, and at the end of the month you take it off and leave it on a tree to help the tree to become healthy and fruitful. There are many different legends about Martishor. This one was sent to me by a friend in Russian. I translated it to share with you. Happy and peaceful March to All! I am listening, on the phone and Skype, to friends who live in Crimea. Some of them are ethnic Russians, some Ukrainians, some western Ukrainians… Everybody has a different vision on current events in Crimea, everybody has a different agenda, but all of them want peace… spring and peace. Crimea is one of the most beautiful places on Earth… Crimea, with the stroking blue-green waves of the Black sea… Crimea, with its dormant volcano Kara-Dag. Crimea, where people gather for vacations, enjoy the fresh air, the pebble beach, the smell of the sea weeds in the coastal breeze… Crimea, where people meet and become friends for life, where they play guitars on the shore under the starry sky, where they listen to the music, fall in love, and carry back home memories that last for life. The thought to leave my country came while I was in Crimea, when events in Moldova and Chechnya were evolving as they are evolving in Ukraine now. The days flew cheerfully in Koktebel. In the evenings we gathered at Anna and Vladimir’s home, local residents who provided simple living for people on vacation. We sang songs with a guitar, told jokes, laughed a lot, drank plenty, and ate heartily. “It is time to split.” Boris said. “You’ve only arrived! Why do you have to leave?” I asked. I got a chance to go back to Crimea a couple of years ago where the Russian version of Love Is Never Past Tense was published. In the picture: Koktebel, Crimea. Kara-Dag is on my left. It was the same Crimea, like it was years ago—but at the same time it was not. I tried to compare my feelings to the ones I had there before, but I could not. The same sea, the same sky, the same horizon… What made it so different? And it struck me: dogs! Hungry dogs in the streets all over. They can run into you even on the beach. “Where are all these hungry dogs are coming from?” I thought. I hardly passed a grocery store without buying another kilogram of hot dogs to help hungry animals. Near a side wall of one store, I noticed a little mommy-dog with several, maybe one week old puppies. She looked at me with such pain! She was hungry. So were her babies. I dropped three hot dogs in her mouth, one after another. They hit the bottom of her stomach without being chewed. Now, tanks are rolling down the streets of Crimea, trying to “enforce peace”. Can peace be enforced? Let’s hope that agendas will merge! Let’s hope a vision will be shared! Wishing you peace in the coming spring!